Retractable spout expandable up to 20 in. Improve the look of your kitchen by adding a stylish and durable Vigo faucet. Stainless steel finish with matching deck plate all solid brass construction which ensures durability and longer life. Faucet features single function pull-out spray head with power spray. Includes a spray face that resists mineral buildup and is easy-to-clean. 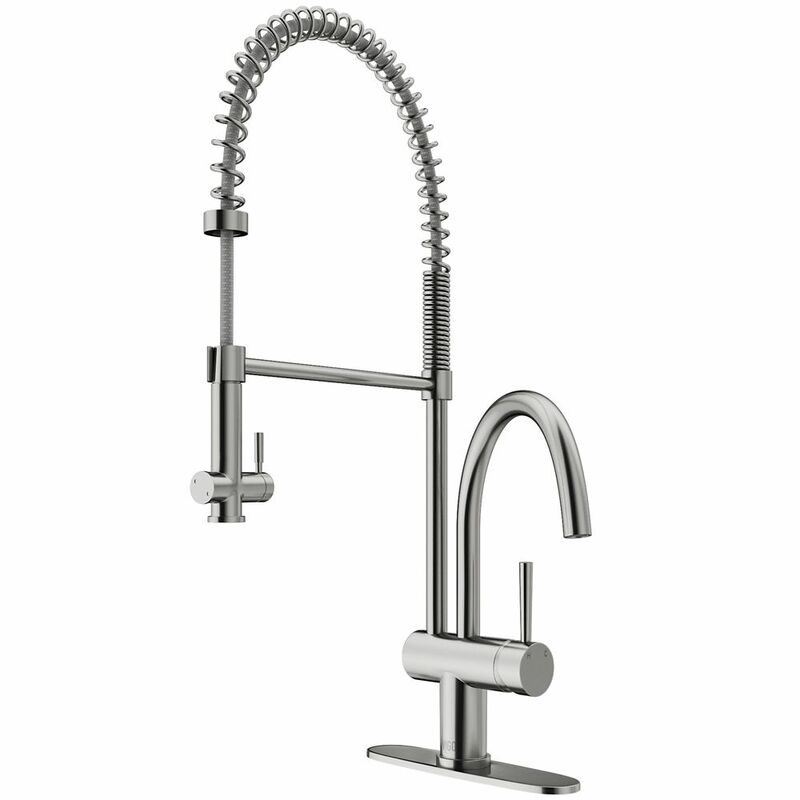 Stainless Steel Pull-Down Spray Kitchen Faucet with Deck Plate This stylish and durable faucet is sure to give your kitchen sink a new look. Stainless Steel finish with matching deck plate all solid brass construction which ensures durability and longer life. Faucet features a spiral pull-down spray head for powerful spray and separate spout for aerated flow. Stainless Steel Pull-Down Spray Kitchen Faucet with Deck Plate is rated 4.4 out of 5 by 59. Rated 4 out of 5 by Nirmala from Fantastic Kitchen Faucet Love this faucet. And I love that I can call the company with any questions for a quick response. Excellent quality faucet! Rated 3 out of 5 by jomasandur from Good looking but not that great. The support arm for the sprayer head sags and it can't be straight it looks crooked. Rated 4 out of 5 by reneeromeo from I wanted to love it... It lost a star because of the sprayer. I love that the sprayer is very tall. I can easily rinse large cookie sheets but if you use hot water through the sprayer, there isn't any insulation where you place your hand and it gets very hot, very fast! My horizontal bar is sagging just like everyone else's (yours will too). I also thought the the 'rod' between the spring and the horizontal bar was metal. It is not! It's just exposed vinyl tubing. I honestly thought I was missing a part. You don't realize it until the last step. Please redesign this sprayer. I want to LOVE this faucet.